In pre-market trading, futures are mixed after stocks in Asia traded moderately higher on Monday. The Dow Futures are down -3.00 points to 17,492.0. The S&P 500 Futures are unchanged at 2,043.5. The Nasdaq Futures are lower at 4,321.5, down -2.50 points. The Russell Futures are showing a gain of 1.10 points to 1,101.1. In overnight trading in the Eastern Hemisphere, China’s Shanghai Composite gained 23.75 points or 0.84 percent to 2,850.86. The Nikkei in Japan was up 54.19 points or 0.33 percent to 16,466.40. India’s NSE Nifty was higher by 45.85 points or 0.59 percent to 7,860.75 and the S&P BSE Sensex was up 163.66 points or 0.64 percent to 25,653.23. In Europe the FTSE 100 is down at 6,113.71 for a loss of -24.79 points or -0.40 percent. The FTSE 250 is higher by 5.45 points or 0.03 percent at 16,655.75. In Germany the DAX is at 9,952.90 for a gain of 90.78 points or 0.92 percent. In France the CAC 40 is lower at 4,279.62 for a loss of -40.37 points or -0.93 percent. In the U.S., the focus will continue to be on the economic indicators which have been pointing to a slightly weaker economic direction in the recent weeks and especially after last week’s retail sales pushed market valuations mostly lower. On Monday, the market will receive reports on the Empire State Manufacturing Index and the Housing Market Index. Neel Kashkari, Minneapolis Federal Reserve Bank President, will also be speaking in the evening. Stocks actively trading in the pre-market include Transocean, Target, Facebook, United Continental, NRG Energy and Yahoo! Inc. Yahoo! has been reportedly narrowing its bidders for a buyout and potential buyers now include an investing group with support from Warren Buffet as well as Verizon. Major earnings reports for the week in the Dow Jones Industrial Average include Home Depot, Cisco and Wal-Mart. All three stocks traded lower Friday, ahead of their earnings reports later this week. U.S. market indexes closed broadly lower on Friday as retail stores weighed on market valuations and retail stocks were broadly lower. The market also received the retail sales report which was just above expectations with an increase of 1.3 percent for April versus consensus of 0.9 percent. However, while the report was slightly higher than expected retail department store sales were mainly flat and most of the increase was in automotive sales. 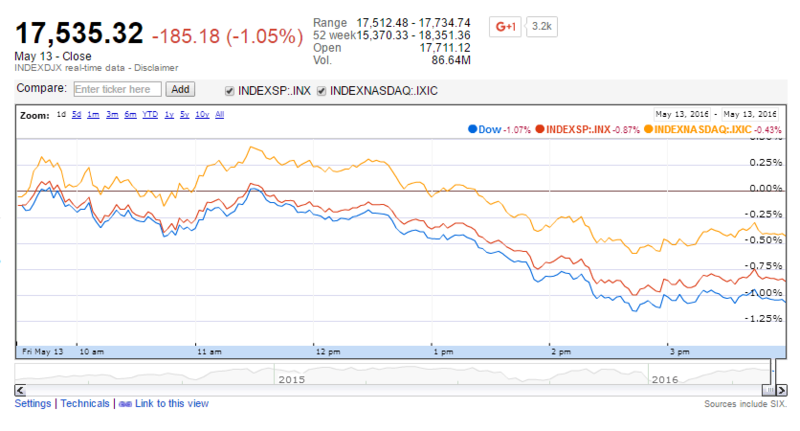 On Friday, the Dow Jones Industrial Average was down 185.18 points or -1.05 percent to 17,535.32. The Standard & Poor’s 500 was down 17.50 points or -0.85 percent to 2,046.61. The Nasdaq Composite was down 19.66 points or -0.42 percent to 4,717.68. Other notable index closes included the small-cap Russell 2000 down -6.16 points or -0.56 percent to 1,102.44; the S&P 600 at 677.30 for a loss of -4.89 points or -0.72 percent; the Dow Jones Small-Cap Growth TSM Index at 6,747.52 for a loss of -41.61 or -0.61 percent; the Dow Jones Small-Cap Value TSM at 8,056.38 for a loss of -72.21 points or -0.89 percent; the S&P 400 Mid-Cap Index at 1,440.60 for a loss of -13.18 points or -0.91 percent; the Russell 3000 at 1,203.53 for a loss of -9.87 points or -0.81 percent; and the Dow Jones U.S. Select Dividend Index which closed at 584.50 for a loss of -5.40 points or -0.92 percent.